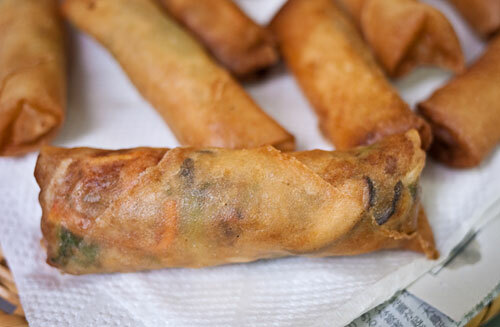 Spring rolls are quite easy to make as long as you break the steps down. First you need to make the filling and let it cool down. You could even use leftovers, and it's fine to make the filling several hours in advance or even the day before. Next you need to wrap the rolls. Finally, you fry them. You can do the make-the-filling step some time in advance, but the rolls do need to be wrapped just before you fry them or the skins may become soggy. I also recommend using readymade spring roll wrappers, which are made from white flour and water. These are available at any general Asian, Chinese or Japanese market, in the freezer section. They're about 9 inches (23cm or so) square, so you can't mix them up with the smaller shumai or gyoza (potsticker) skins. 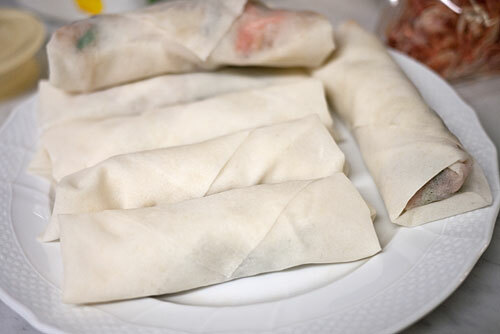 Making paper-thin spring roll wrappers from scratch takes spring rolls out of the realm of something you could conceivabley make for an everyday dinner to an epic, complicated task that should only be attempted when you have a whole weekend afternoon to spare. All the vegetables should be cut so they are about 7 cm / 3 inches long. 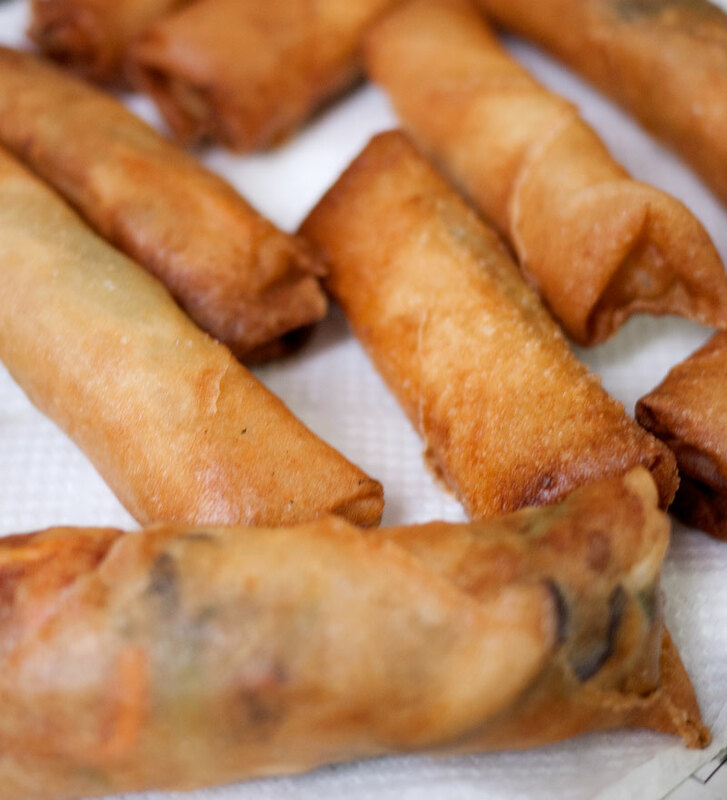 If your spring roll wrappers are frozen, make sure you defrost them completely, in the packet, before trying to separate them, or they will rip. Keep unusued wrappers covered with a damp cloth - they dry out rather fast. Heat up the sesame oil in a wok or frying pan over medium heat. Add all the shredded vegetabeles and stir fry until crisp-tender. Add the cooked meat, soy sauce and sake. Taste and add salt and pepper to taste. Add the water in which the cornstarch or potato starch has been dissolved. Stir until the liquid surrounding the vegetables and meat has thickened and is transparent rather than cloudy. Take off the heat and let cool. Divide the filling into 10 or 12 portions, as many as you have wrappers. Place a wrapper diagonally, so a point is facing you. Put some of the flour-paste you've made on the two sides that are away from you. Put a portion of the filling fairly close (but not touching the edges) of the point closest to you. The key is to not overfill - if the sauce/liquid of the filling leaks out, your rolls may burst during frying. Heat the frying oil to around 140°C (284°F) - a fairly low temperature. If you've ever made french fries (chips) at home, this is about the temperature you fry the potatoes in initially, to cook them through but not brown them. If you don't have a fryer or a kitchen thermometer, you can gauge the temperature by putting in a piece of raw potato; it should cook but not brown. Put the spring rolls in gently, 2-3 at a time. They should brown gradually, turning very crisp on the outside and molten hot on the inside. You do not want the surface to become bubbly and mottled as you seein some restaurant spring rolls. You want it to be perfectly smooth and light. Drain the spring rolls well. I use a flat woven bamboo tray kind of thing lined with newspaper, with kitchen towels on top. Submitted by maki on 2011-10-20 17:15. Looks tasty! I love how translucent the wrappers become. Are these the ready-made wrappers made with rice/tapioca flour? They are usually made with wheat flour. I have made pot stickers from scratch before and I can't recommend using the pre made wrappers strongly enough. Making the filling the night before also makes the entire process much more manageable. Many times in Japan I would be given vegetarian versions of harumaki. They were so delicious but I could never work out what was in them. Please, could you offer some vegetarian suggestions. Just leave out the meat in the recipe above, that will work fine. These look phenomenal. 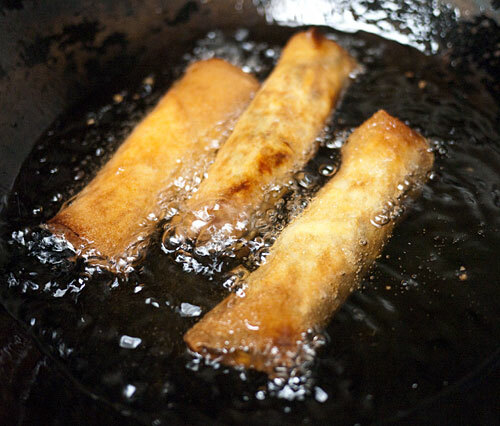 I love spring rolls and they are so much better straight out of the frying oil, as opposed to ordering from a restaurant and bringing them home. These look yummy! I started making mine vegan-friendly a few years ago and liked the recipe so much that it's the only one I use now. Hope you're doing well. Those look great! I'm going to spend this afternoon making a batch. Do you know how "Chinese" spring rolls would differ from Chuuka-style spring rolls? So is too high a temperature what causes the bubbling then? Or is to cooking it too long? 'Cause I kinda like the bubbly texture for other things (like fried wonton chips), but can never seem to cause it exactly when I want to, ha. This is really interesting. I've been reading about the different methods to prepare spring rolls. I like the addition of green onions, cabbage and sake (haven't tried that before). Looks delicious! Have you ever heard of harumaki filled with chicken and cheese? I had some at a Japanese restaurant (they call themselves a Thai sushi bar but it's really just a bunch of Japanese and Thai foods on the same menu) and I was wondering if they were authentic/common. They were good even if they're not, though!